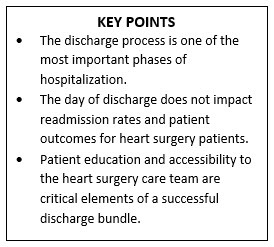 Despite a common belief that weekend and holiday discharge after major heart surgery may impact hospital readmissions, research published online today in The Annals of Thoracic Surgery showed that day of discharge does not affect readmissions. For their study, Dr. Benharash and colleagues reviewed data from The Society of Thoracic Surgeons Adult Cardiac Surgery Database for all patients who underwent non-emergency heart operations between 2008 and 2016 at Ronald Reagan UCLA Medical Center. The researchers identified 4,877 patients, of whom nearly 20 percent were discharged on a weekend or holiday. This subset was particularly important because of the so-called “weekend effect,” which has been described as worse outcomes attributed to decreased staffing and increased transitions of care. In 2010, UCLA launched a Readmission Reduction Program. The program includes discharge education, detailed medication instructions, postoperative care coordination, and routine phone calls for 4 weeks after discharge. Most recently, cardiac surgery patients who have been discharged home received discharge kits equipped with wireless enabled blood pressure monitors, oximeters, weight scales, and miniaturized electrocardiogram sensors synced to a mobile tablet device. The mobile application prompts patients to perform daily measurements and answer questions regarding pain, physical activity, and surgical wound appearance. Patients’ responses are initially screened by the telemonitoring companies who generate summary reports. The UCLA cardiac surgery discharge staff reviews any information that falls outside of the normal range and triages the details to the appropriate provider for swift, real-time interventions. Resources such as these, in addition to improved access to expert advice following hospitalization, have significant potential to impact a patient’s outpatient trajectory, explained Dr. Benharash.